Head south from Lakeville on the leisurely Route 41, a scenic state highway of pastoral landscapes and saltbox farmhouses. After a 30 minute drive, you’ll arrive at Macedonia Brook State Park in Kent. Grab a trail map at the front office and take to the white blazed Cobble Mountain Trail — the overlook offers a magnificent view across the Harlem Valley to the distant Catskills. It’s a spectacular sight year-round, but at the height of foliage season, those incredible colors are in a league of their own. Once you’ve had your foliage fix at the Cobble Mountain overlook, take a short detour to the Bull’s Bridge, which crosses the Housatonic River. The sight of this charming, classic New England covered bridge surrounded by oranges and browns is the thing of autumnal postcards. This also makes a great opportunity to set up a scenic fall picnic or venture into downtown Kent for a bite to eat. Head south on Macedonia Brook Road and make your way east on Route 341. On this leg, you’ll drive between the aptly-named North and South Spectacle Ponds, whose charming waterfront woodlands are worth a drive-by snapshot. ?You’ll reach Mount Tom State Park in Litchfield after about 30 minutes, where you’ll embark on a short, one-mile hike to reach a stone tower 1,325 feet above sea level. 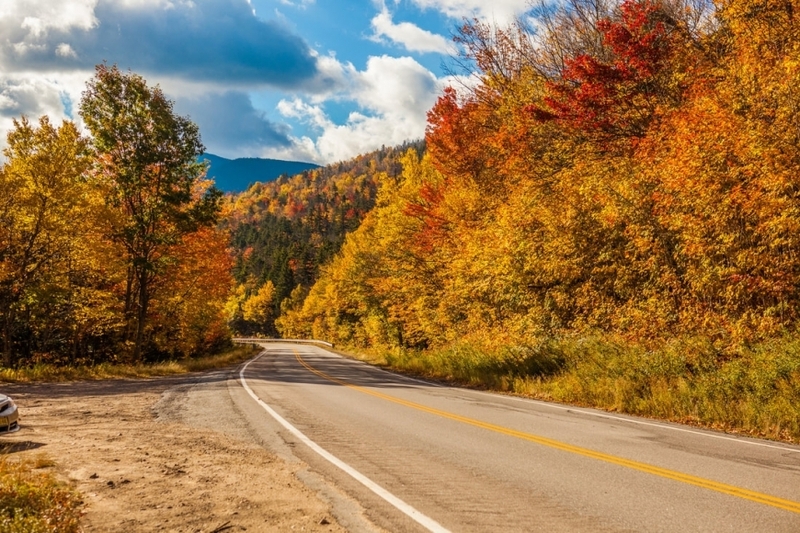 ?The third leg of the trip has a few more twists and turns than the others, but this leaf peeping pit stop is well worth a lapse from the comfort of cruise control. At the Mohawk State Forest entrance on Toumey Road, take a left and then turn right at the “T” intersection to get to Mohawk Mountain Road. Drive up the path and park your ride at one of several spots to soak in scenic vistas of the Catskills and Taconic Mountain Range. If you haven’t had your fill of hiking after the Cobble Mountain trail, you have the option to explore either the Mattatuck or Mohawk blue-blazed trails that cross the site. After another 20 miles or so of rolling hills and winding stone walls, you’ll be back in the quiet comfort of Lakeville. While we have plenty of places to peep leaves in the Litchfield Hills, at Interlaken Inn can you pull up an Adirondack chair and take in the views from your porch — all while scrolling through snapshots from your fall foliage tour in Connecticut.